The motivation for the system comes from observations Miles has made in venues as small as a church board of directors and as large as an Air Force operations center. When people come together, they bring copies of documents — agendas, minutes, presentation slides — and receive more documents. They exchange information, discuss issues, and make decisions, recording them as scribbles on their copies of the documents they carry away with them. Smart Notebooks will mimic this process across the Internet (and avoid a lot of manual copying in the process). Miles draws models from several sources, including one of his favorite tools that died out: Hypercard (he sometimes refers to Smart Notebooks as “HyperCard, for groups, running in a browser”). He also looks to TiddlyWiki (a personal wiki implemented as a single local file, opened and edited in a browser) as a model for smart notebooks, coupled with a peer-to-peer, replicated messaging model inspired by USENET News’ NNTP protocol. The latest HTML5 standards and the new generation of web browsers make the project possible. Miles’ goal is a system that can let people collaborate in peer-to-peer fashion with minimal reliance on a central system hosted by a company. 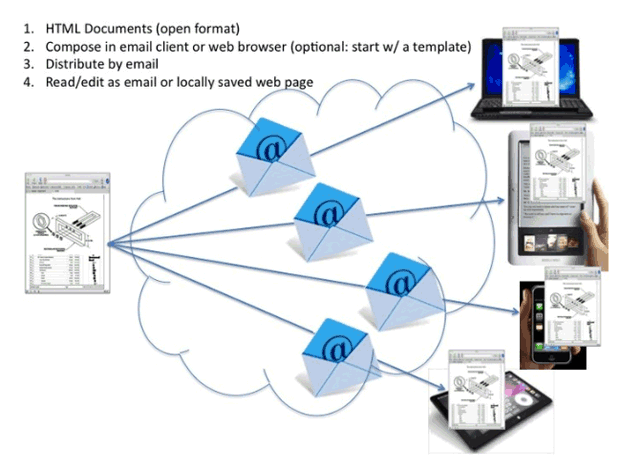 Users will simply create a document in their browser (like editing a wiki page), then send copies via email. Everyone stores their own copy locally (as a file or in their browser’s HTML5 Web Storage). Changes will be pushed across the net, while notifications will show up as an RSS feed. Opening one’s local copy will automatically pull in changes. For more details, and to support the project, take a look at the project’s Kickstarter page. Miles is particularly looking for a couple of larger sponsors — folks organizing an event, a conference, a crowdsourcing project, an issue campaign, a flash mob — who are looking for a better coordination tool and can serve as test cases.